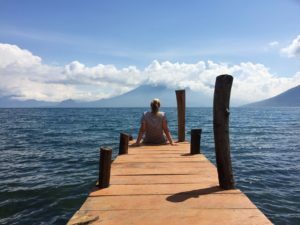 I arrived in Central America knowing very little Spanish and quickly realised it wasn’t going to be enough to get me through a year of travel. 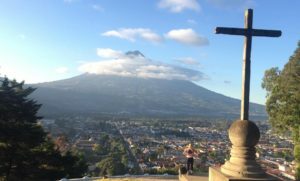 I’d heard from many people that Guatemala was the best place to learn and after spending an afternoon wandering around a few of the schools in Antigua I decided I’d set up some roots for a while and get my study on at the Antiguena Language School. It turned out to be one of the best months of my trip. 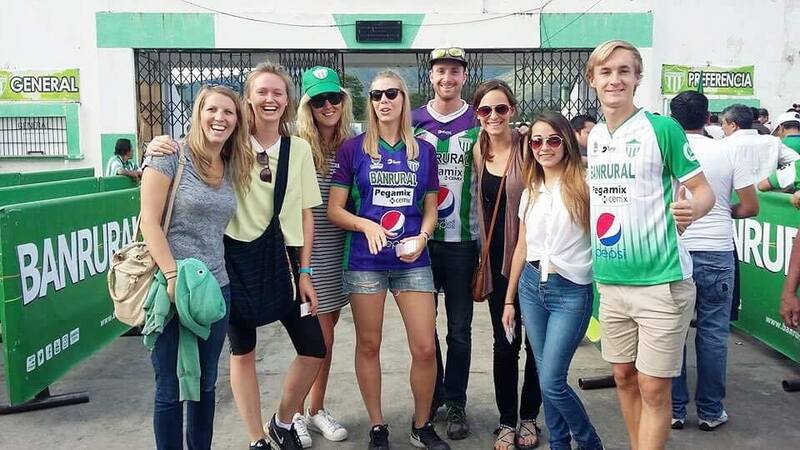 So here’s 8 reasons I strongly encourage you to learn Spanish in Guatemala. Guatemala is famous for having the most neutral accent in Central America. They speak slowly, they are really patient with tourists and they don’t have too many slang words. (Trust me, this is a good thing). Post my month in Antigua I took some lessons in both Nicaragua and Bolivia and I did struggle a little with the accents and speed. Antiguena Language School is by far the most affordable school in Antigua, making it one of the most affordable Spanish School’s in the world. It cost me just over $33 AUD per day for 4 hours of private classes, accomodation and three meals. What a bargain! 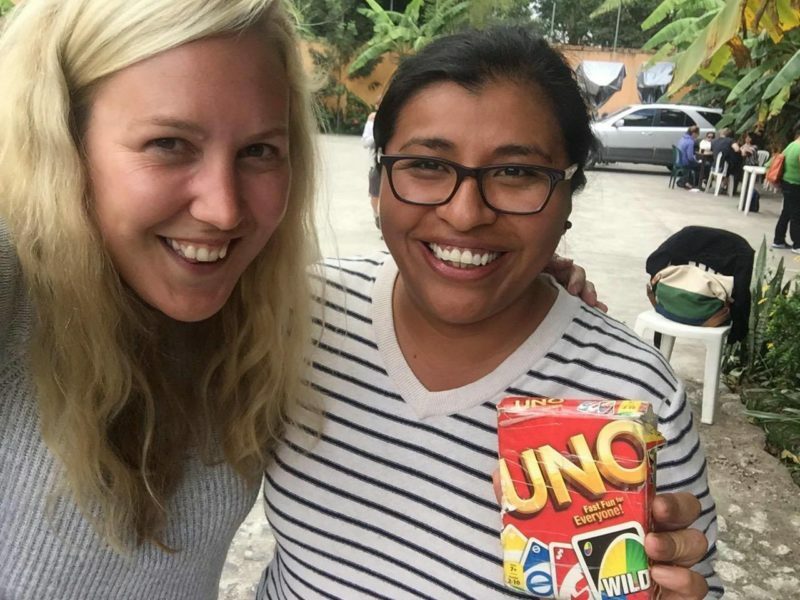 Another great reason to learn Spanish in Guatemala is that you can live with a lovely host family. 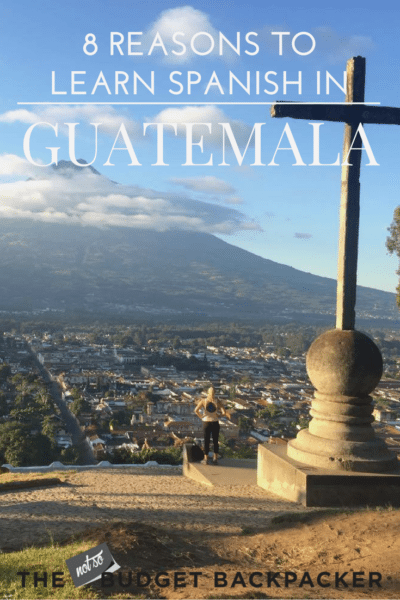 You’ll get to try authentic Guatemalan food and improve your Spanish conversation with them everyday. I stayed with a fantastic lady named Esme, and even had my own private room. My teacher at Antiguena Language School is one of my favourite people I’ve met so far on this trip. She is an absolute classic, and we had numerous conversations about boys and beers. It just didn’t feel like school. The way classes are structured are two-hours of grammar, a half an our break and then two-hours of conversation. It’s the perfect balance to improve your Spanish at lightening fast speed. Volcano Acatanango looms over Antigua with neighbouring active volcano Fuego lighting up the skies with it’s eruptions some nights. Most students would spend a weekend trip hiking the volcano, and I was no exception. While the hike was extremely difficult (I’m talking one of the hardest things I’ve ever done) it was totally rewarding once it was over. And a great way to bond with new friends as you climb the slippery gravel in the dark and freeze half to death. 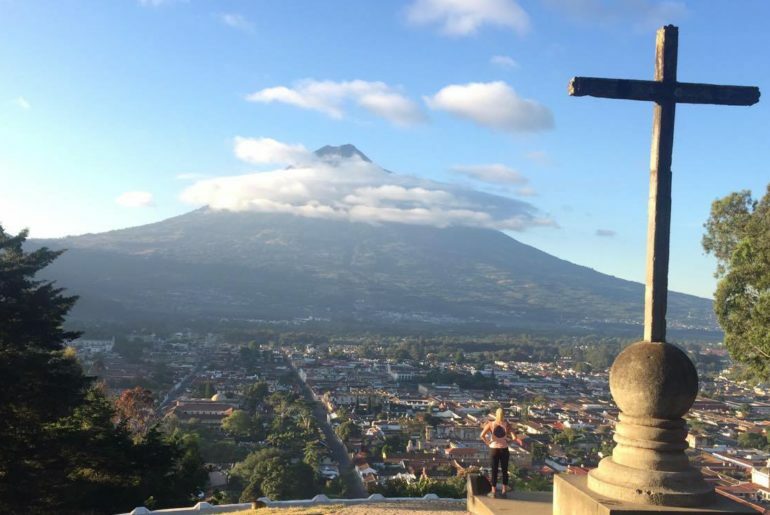 If you want more details, check out my review of hiking Acatenango. Antiguena offers after school activities every day. From cooking classes, to walking tours, to visiting the chocolate museum. So it’s a great way to unwind post class and make new friends. Speaking of making fweeeeiiiiinds, the school is a great place to do so if you’re traveling solo. The half-hour break is a great time to chat and exchange notes on class. Along with the after school activities and the fact that everyone is having their own unique experience in their home stay, I made friends that I decided to travel on to Nicaragua and even Argentina and Chile with. Antigua is a gorgeous colonial city with some of the best coffee in Central America. I got into the really bad habit of treating myself to a coffee and cake every afternoon after class. I’ll excuse this behaviour with the fact that I had to write and article on Antigua’s best cafes, restaurants and bars. Therefore, that’s a perfectly legitimate excuse, right? 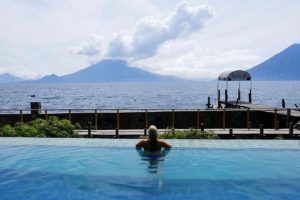 not convinced You Should Learn Spanish In Guatemala? check these out!